When my son was in his last year of elementary school, I attended a back to school night. His teacher shared the curriculum they would be covering, among other things, including an emphasis on getting kids ready for middle school. I continued to hear this message throughout his fifth grade year. I heard it from my son, his friends, and his teacher. Based on what my son was hearing, he thought middle school was going to be harder, there would be more homework, and he had to be super responsible. At the time, I didn’t realize how the topic of middle school was being used as a “threat” or “misplaced motivational tool”, until I read Peter Lorain’s article, “Transition to Middle School” (on the National Education Association’s website http://www.nea.org/tools/16657.htm). I began to wonder, did my son’s elementary school teacher(s) inadvertently cause him to have anxiety about middle school? Mr. Lorain, a retired Oregon high school teacher and middle school principal, found that kids form most of their impressions about middle school from information they’ve received from their elementary school teachers, older siblings, and neighbors. 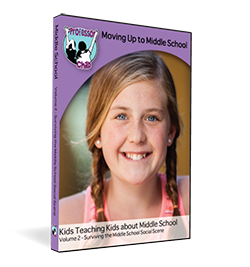 When kids are used to hearing negative comments about middle school, even if these comments are meant to motivate, they may not be able to form a realistic picture of what middle school is like, which can lead to fear and anxiety. Mr. Lorain goes on to say, “It’s important for the schools to have a comprehensive ‘Transition to Middle School’ program to help incoming middle school students be positive and look forward to the coming year.” He suggests a transition program that includes a realistic expectation of what middle school will be like and a positive first impression. At Professor Child, we think it’s important for kids to hear from their peers. Ultimately, we want kids to know they’re not alone in what they’re experiencing and to give them a sense of hope.